In 1978, gifted student and writer Greg Roberts turned to heroin when his marriage collapsed, feeding his addiction with a string of robberies. Caught and convicted, he was given a nineteen-year sentence. After two years, he escaped from a maximum- security prison, spending the next ten years on the run as Australia's most wanted man. Hiding in Bombay, he established a medical clinic for slum- dwellers, worked in the Bollywood film industry and served time in the notorious Arthur Road prison. He was recruited by one of the most charismatic branches of the Bombay mafia for whom he worked as a forger, counterfeiter, and smuggler, and fought alongside a unit of mujaheddin guerrilla fighters in Afghanistan. His debut novel, SHANTARAM, is based on this ten-year period of his life in Bombay. The result is an epic tale of slums and five-star hotels, romantic love and prison torture, mafia gang wars and Bollywood films. 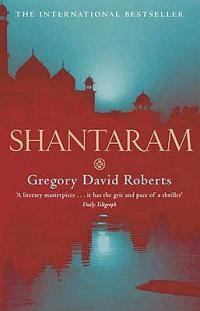 A gripping adventure story, SHANTARAM is also a superbly written meditation on good and evil and an authentic evocation of Bombay life. Yes, I finally read it ... and I finally finished it. Although since I took less than a month, I think I read it faster than most people I know. Haha. I figured it was the perfect book to tide me over lazy holiday reading and flights to Cape Town. I was right. I'll admit I wasn't all that interested in reading this initially. But slowly everyone I knew had read it and everyone raved about it. So why not. No matter how daunting the 933 pages may seem. Well, I won't say they flew past, but it didn't feel as tho the story ever dragged. In fact it was rather an epic whirlwind of storytelling ... after I got past my initial impression of it's Lord-of-the-Rings descriptive style (I couldn't read any of the LOTR books because I can't sit around still reading while you take 4 pages to describe one tree :P). I've now looked the author up on Wikipedia, because I am sort of fascinated with what exactly happened to him after this ... I mean here's a book where he confesses to an awful lot of criminal activity, and there is his escape from Australian prison ... so how is it he is a free man now? Sadly it's not especially well explained. Anyhoo. Take the time, read this book.